3 Bedroom Semi Detached House For Sale in Bedford for Guide Price £350,000. This very impressive three bedroom/three bathroom extended semi-detached family home is located in the popular village of Barton Le Clay. 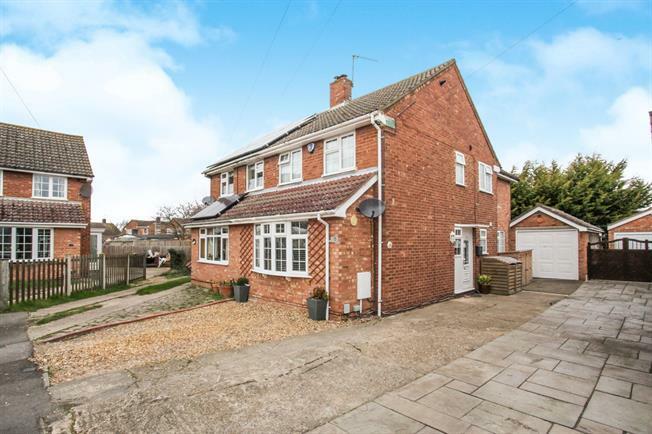 Situated in a pleasant quiet cul-de-sac and is within easy reach of all local amenities and fantastic school catchments this would make the perfect starter home. The ground floor comprises of a large front living room, spacious kitchen/dining room and a family bathroom. On the first floor the property offers a shower room and three generous sized bedrooms one benefitting from an en-suite. Externally the property offers a large detached garage, two externally workshops, an enclosed rear garden with artificial grass and a front driveway for many cars. Double glazed uPVC window. Radiator, solid oak flooring. Double glazed uPVC window. Roll top work surface, wall and base units, stainless steel sink, integrated oven, gas hob, space for dishwasher, space for. Double glazed uPVC window. Heated towel rail, tiled flooring. Low level WC, panelled bath, shower over bath, pedestal sink. Double bedroom; double glazed uPVC window. Radiator, solid oak flooring. Heated towel rail. Low level WC, walk-in shower, wall-mounted sink. Shower, wall-mounted sink. Double glazed uPVC window. Radiator, carpeted flooring, spotlights. Heated towel rail. Low level WC, walk-in shower, wall-mounted sink.